Two hundred former Royal Enfield employees died in World War I, Jorge Pullin reports on his My Royal Enfields blog. "The horrific carnage of World War I is difficult to comprehend with our modern eyes," he writes. Jorge's item is complete with a clipping recording the Peace Day 1919 decorations at a Royal Enfield office in London. Jorge has mined many such World War I era clippings from contemporary publications to illustrate the part Royal Enfield motorcycles played in the war. You can learn a lot about Royal Enfield's role during World War I and in the years leading up to 1930 in the Royal Enfield Early Years Virtual Museum on Jorge's blog. Just click on the year that interests you. Surprising, to me, is that several of Jorge's items indicate that Royal Enfields remained available for sale to the general public early in the war. In 1916 there was still speculation that motorcycles with sidecar mounted machine guns would soon be racing around battlefields, as Jorge illustrates with this June, 1916 clipping. 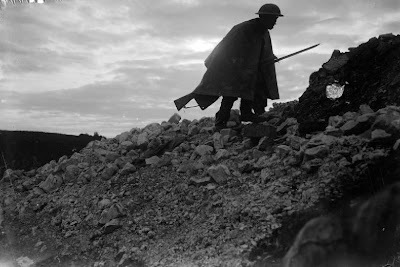 July 1, 1916 would put an end to that notion, with the massive British attack on the Somme that immediately bogged down in trench warfare. British General Douglas Haig had not expected a breakthrough, but had kept his cavalry handy in case one came. He was ridiculed for thinking mounted lancers still had a role to play. Romantic thoughts of shooting machine guns from speeding motorcycles were set aside for the moment. They would reemerge for World War II. Haig called the Somme "The Opening of the Wearing Out Battle." The war would be one of attrition, demanding all the soldiers and material Britain and its allies could muster. It would not end until Germany ran out of soldiers and materials to resist. Motorcycle production for civilian use was one small casualty. Enfield plants soon filled only military contracts, for munitions if not motorcycles. In later years, Haig and the other generals were condemned for wasting the lives of a generation in trench warfare. Historian William Philpott disputes the justice of that in his recent book "Three Armies on the Somme." It's a big book: 640 pages. But Philpott's basic argument seems to be that the empires of the day had no other way to fight World War I. He points out that, at the time of the battle, Haig's tactics were openly criticized, but his strategy — bloody war to the death — seems to have been accepted by public, politicians and soldiers alike. Only later, when the sense spread that World War I had failed to put an end to war, was its human cost judged a bad investment. The memorial to the missing of the Somme, at Thiepval, France bears more than 70,000 names (the exact number changes as bodies continue to be found and identified). The memorial is to the dead of Britain and South Africa alone — and only to those (a minority) who have no known grave. For us, it seems an unimaginable horror. And yet, as Philpott writes, "Those who fought the battle of the Somme judged it a success..."
Thanks, David! I believe the reason motorcycles continued to be sold in the first years of the war was that the way the war unfolded caught people by surprise. Both sides were expecting a swift victory, similar to the one in the Franco-Prussian war of 1870, where Paris fell in six months. They were totally blindsided by the stalemate of the trench warfare that ensued. As a consequence it took almost until 1917 for the UK to institute a war economy, with rationing, production oriented towards the war, etc. The lack of rationing led to many shortages, including petrol, which led to the experimentation with the balloons of coal gas powering Enfield sidecar rigs.